Oppo has recently announced on its Google+ page that it will be launching the international version of its latest flagship Android smartphone – the Oppo N1, on 10 December 2013 and it looks like we Malaysian users might be able to purchase it on their online store with free shipping. According to the post shared by Oppo, the phone is priced at USD$599 (about RM1,930) and if you visit the link provided, you will be brought to a page that tells you that you can purchase Oppo products from Oppostyle, the company’s own online store with free shipping for orders of USD$100 and above. Announced back in September, the Oppo N1 stands out from the crowd of smartphones with a 206-degree swiveling camera located on the top of the device. The camera has a f2.0 13MP sensor and features a six-element lens similar to those found on the Nokia Lumia 925, 1020 and the new iPhone 5S, making it the the first Android smartphone with such lens. But that’s not all, touted as a camera phone, the N1 also has the company’s own image signal processor (ISP), slow shutter mode, dual-mode LED flash that automatically detects when the camera is used at the front or back, and customizable brightness on the LED flash light. It has a 5.9” Full HD IPS display and is powered by a 1.7GHz Qualcomm Snapdragon 600 processor with 2GB of RAM on board. Other specs include 16/32GB of internal storage, and a 3,610mAh battery on board. But wait, that’s not all the goodies the N1 brings, it runs on the company’s own Color OS but in addition to that, it looks like Oppo will be offering the CyanogenMod Edition with CyanogenMod pre-installed. 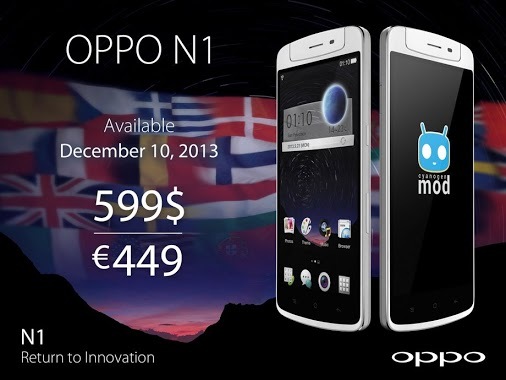 So, anyone here getting the Oppo N1? Visit our previous post to find out more about the device or bookmark Oppostyle online store to purchase it on 10 December 2013, fingers crossed that the N1 will be up for order then.